The great thing about working here at Come walk with me UK is the massive diversity of the walks we do and the places we do them in, this past warm weekend however has taken me to two of our favourite places, the Lake District and Snowdonia, surely two of the most beautiful spots in the UK! Saturday was our first time working for Collette Holidays, an American company who had wanted to add a walking option to their customers visiting the Lakes. We had a spry and nimble group of mature hikers from (amongst other places) New York state, Texas and Florida, and they seemed to have bought some Floridian weather with them as the sun beamed down upon us for the whole of our walk. Leaving Grasmere behind we passed Dove Cottage and made our way upto the “Coffin Route”, so called because the coffins of the deceased had to be bought along it to St Oswald’s in Grasmere before the church in Ambleside was established. 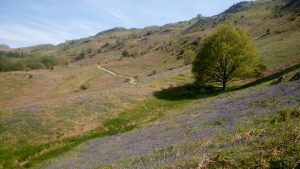 It’s a lovely route that contours along below the Fairfield Horseshoe ridgeline and was rich with wild flowers and birdsong, not to mention views of Rydal Water and Loughrigg beyond. The Wordsworthian theme continued as we passed Rydal Mount and after a quick peek at Rydal Hall we crossed the main road and followed the waterside path along Rydal Water to the wooded shores of Grasmere itself. The Bluebells on the slopes of Loughrigg were particularly spectacular and the Wild Garlic is out and adds a certain allium pungency to any routes that pass it by. 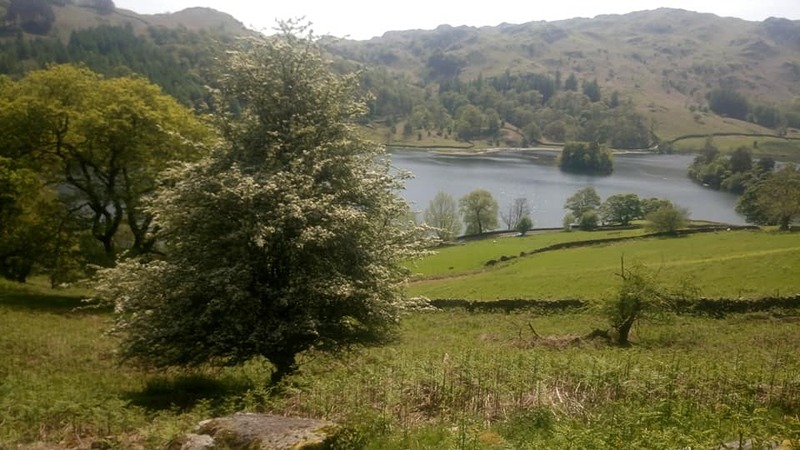 We made it back into Grasmere three hours after we departed satisfied with a beautiful low level walk showcasing a perfect mix of culture and nature. No rest for the wicked though! No sooner had I seen my walkers back onto their coach then it was back in the car and heading down to Snowdonia with Detective Inspector Kurt Wallender keeping me company on my audio book. I got into Nant Peris as the evening sun was illuminating Crib Goch, got the tent up and even had time for a pint in the “Vaynol Arms” before crawling contentedly into my sleeping bag and drifting away. 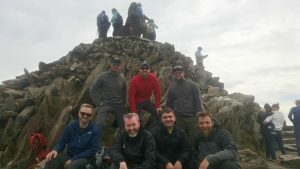 It was up and at ’em early though as I was meeting a team from Maximum Adventure on their last leg of the Three Peaks Challenge fundraising for a charity that works with families suffering bereavement due to stillbirths. 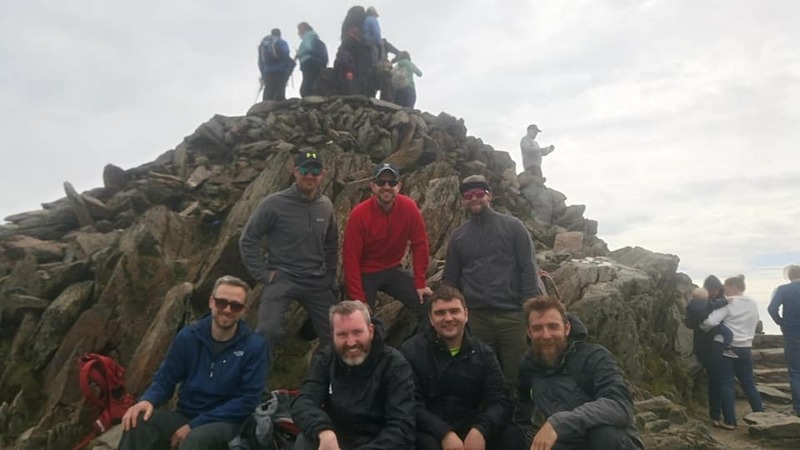 The team had exactly four hours to complete the challenge in 24 and we had them back in Pen Y Pass carpark in 3 hours and 57 minutes, no mean feat at the end of such a challenging trip! It was a great day on Snowdon and in stark contrast to couple of weeks ago the views from the ridge and the summit were awesome. Even though you may never have the summit to yourself, and even though there is a railway and a café, and even though it is one of the most climbed mountains in the world, if you catch the right view at the right moment it is still a magnificent mountain. Good job too, as I am back there on Thursday after another jaunt up Tryfan with the BXM CRUX programme. Busy, busy, busy! This sounds like loads of fun! I’d love to visit sometime and do one of these walks. Well, please let me know if you have any specific requests…..